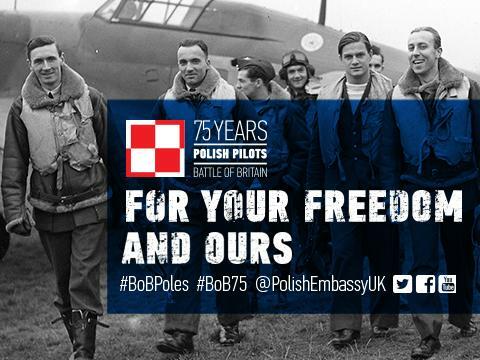 The Polish Embassy (@PolishEmbassyUk) has begun a Twitter campaign to raise awareness of the role played by Polish pilots in WW2’s Battle of Britain. Using the hashtags BoBPoles and BoB75 (it is the 75th anniversary of the battle) it will publish daily images and info celebrating their contribution to a battle every bit as decisive as Waterloo. For the past two years I have been working on a script, with an Anglo-Polish production company, about Jan Zumbach, one of the pilots who flew with the most well known outfit (mainly because it was the first made operational; there were sixteen in all), 303 Squadron, which operated out of RAF Northolt, not far from the Polish War Memorial. Below is part of an early funding submission. Like Agincourt, Waterloo and Trafalgar, The Battle of Britain has become part of Great Britain’s modern creation myth. But like all such legendary tales of derring-do, time (and a few obfuscations and exaggerations) has knocked off some of the rougher edges of the story, leaving a smooth, one-sided narrative, an easily digested piece of jingoism. The truth, as is often the case, is messier and more compelling than the usual tale of British, blue-eyed, blond public schoolboys in Spitfires fighting Nazis in the skies over Southern England (with a little help from the British Empire in the form of Aussies, Kiwis, Canadians and South Africans). Because the Battle of Britain was also the Battle for Europe, as many of the pilots were fighting for their own homelands, trying to defeat Germany so that France, Holland, Czechoslovakia and Poland could be free. The members of 303 Squadron had fought over their own country, and in France before it was overrun, and then made a last stand with the RAF. Older and more experienced than most of the pilots that the host country could provide, they were fighting on several fronts at once – against the Luftwaffe, against unfamiliar planes (the controls were reversed; they were not used to using R/T) and protocols, and against the British prejudice that saw them as demoralized and defeated at best, uncivilised savages at worst. They were also lonely and homesick, as well as constantly worried about what was happening to their families back in Poland. They overcame all those adversities to become the highest scoring squadron in the Battle of Britain, even though the RAF’s reticence to deploy them meant they entered the fray relatively late. And they did this not in the sleek, graceful Spitfire, but the more quotidian Hurricane, the Shire horse to the Spit’s thoroughbred. Like all the Polish squadrons, 303 initially had RAF commanders – ex-stockbroker Ronald Kellett was Squadron Leader – he famously who fitted the men out with uniforms from his Savile Row tailor and paid their wages when the government didn’t – and under him Flight Lieutenants Johnny Kent and Athol Forbes. 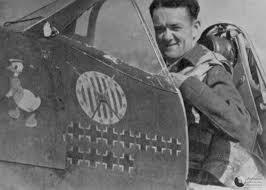 To make matters even more complicated, the highest scorer in the squadron was not a Pole, but a Czech, Sgt Josef František. He ended his career with 15 kills, but died just as 303 was stood down for rest and re-equipment in October 1940, ploughing his plane into a hillside for no apparent reason. It is possible he was suffering from the sort of combat stress Geoffrey Wellum described so well in his memoir ‘First Light’. The squadron was stuffed with interesting characters, but I decided to concentrate on Jan Zumbach, because he began the war as an idealist with an adventurous streak and ended it as a cynic, with mercenary tendencies (he was a gunrunner, diamond smuggler, and one-man airforce for various African rebel groups). It was an understandable arc for a man who felt the contribution of his countrymen was undervalued and who, after all the fighting for its liberation from Germany and Russia, saw his country ‘gifted’ to Stalin at the end of the war. Jan Zumbach, who went on to become 303’s Squadron Leader later in the war and later the one-man Biafran Airforce. The story of 303 also has a powerful contemporary resonance, in that, as “immigrants”, the Polish pilots were faced with prejudice on arrival in the UK, followed by, eventually, acceptance when it transpired they were simply people, with the same hopes and fears as the Brits, who happened to be very good at shooting down Germans. Yet when the economic and political circumstance changed at the end of the war, as outsiders they become convenient scapegoats once more (and accused, in all-too-familiar rhetoric of “taking our boys’ jobs”). The tale of Britain’s treatment of the Poles who served and of those who came as refugees during and after the war is not very edifying. We didn’t even thank them properly before pushing them off to Canada or Rhodesia or Poland or corralling them into camps. But no Poland. The reason being, Stalin was busy subjugating the East and did not want ‘Free’ Polish forces celebrated and he put pressure on the British to make sure they were not represented. I think I am right in saying that the RAF Polish squadrons were invited to take part, but declined once they realised the other Polish services were forbidden from participating. This is the ‘card’ (or end caption) that finishess the script. 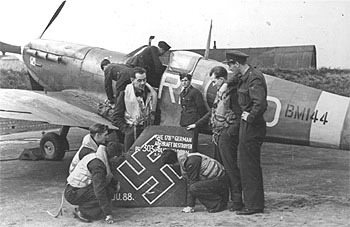 The 147 Polish pilots who served in the Battle of Britain claimed 201 aircraft shot down, around 20% of all Luftwaffe bombers and fighters destroyed. After the war an opinion poll showed that 56% of the British public thought the Poles should repatriated. Many of those who did return were persecuted, executed, imprisoned or deported to work camps. Not until 1992 was the contribution of the Poles serving with western forces recognised in their home country. This entry was posted in Uncategorized on June 21, 2015 by Robert Ryan.